February 7, 2017 – Working in close collaboration, the Government of Tonga, the Secretariat of the Pacific Regional Environment Programme (SPREP), technical experts at research institutions such as Deltares and MWH Global, the New Zealand Ministry of Foreign Affairs and Trade (MFAT) and UNDP technical experts are supporting the creation of a new climate change adaptation project for Tonga that is expected to be brought before the Green Climate Fund for board approval this June. At the request of Hon. Siaosi Sovaleni, Deputy Prime Minister of Tonga, the new coalition of government leaders, technical experts and cooperation entities will combine two ongoing GCF project formulations into a single integrated project proposal. The project formulation mission that took place between January 20 to 28 included discussions with local experts, site visits and the design of a series of interventions to address climate change induced coastal erosion by the cross-agency, cross-functional project team. The proposed GCF-funded project, likely to require more than $40m in grant financing from the GCF, will seek to enhance coastal protection in Tongatapu, Vava’u and Ha’apai, and strengthen national and local capacities for the effective monitoring, maintenance and implementation of community-based adaptation actions. The GCF resources will compliment other initiatives that the Government has planned with its own and external development finance. “By leveraging the technical expertise of a group of engineers from MWH Global funded by the New Zealand Ministry of Foreign Affairs, as well as experts on coastal protection from Deltares to compliment the team of UNDP advisors, Tonga can fast track the completion of the design of an initiative that has been many years in the making,” said Yusuke Taishi, Regional Technical Advisor, Climate Change Adaptation, Global Environmental Finance Unit, UNDP. 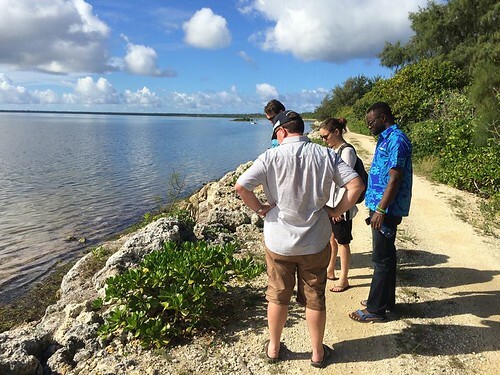 Specifically, the project seeks to build 16 kilometers of coastal protections along the coastline in Ha’apai and Tongatapu, upgrade risk-based land management practices in the Vava’u marine system and support coastal ecosystem restoration. To strengthen national and local capacities, the project will establish a monitoring system for sediment flows and erosion, coral reef health, mangrove health and rock revetment, build capacity to monitor and maintain coastal protection works, and engage with communities to support the maintenance and sustainability of project initiatives. The new project will be implemented by the Tonga Climate Change Department, with UNDP serving as the accredited entity to the GCF. On the request of the Government, SPREP will provide project implementation support. “The financial support provided by the Government of New Zealand through its Ministry of Foreign Affairs and Trade in designing this projects will allow the team and the government of Tonga to build a truly innovative project that takes on multiple variables to produce a sound ecosystem-based approach,” said Pradeep Kurukulasuriya, Head of Climate Change Adaptation, Global Environmental Finance Unit, UNDP. Tonga is a Small Island Developing State with one of the world’s highest climate risks. In 2014, for instance, Tropical Cyclone Ian displaced 70 percent of residents in Ha’apai and caused some US$48 million in damage. That same year, severe draught affected agricultural productions on Ha’apai and Tongatapu. “Simple solutions will not work to address the complex challenges facing Small Island Developing States in the Pacific, such as Tonga,” said Kurukulasuriya.